Deuteronomy 6,1-9 Now this is the commandment, and these are the statutes and judgments which the LORD your God has commanded to teach you, that you may observe them in the land which you are crossing over to possess, that you may fear the LORD your God, to keep all His statutes and His commandments which I command you, you and your son and your grandson, all the days of your life, and that your days may be prolonged. Therefore hear, O Israel, and be careful to observe it, that it may be well with you, and that you may multiply greatly as the LORD God of your fathers has promised you; 'a land flowing with milk and honey.' Hear, O Israel: The LORD our God, the LORD is one! 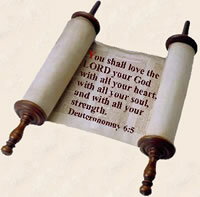 You shall love the LORD your God with all your heart, with all your soul, and with all your strength. And these words which I command you today shall be in your heart. You shall teach them diligently to your children, and shall talk of them when you sit in your house, when you walk by the way, when you lie down, and when you rise up. You shall bind them as a sign on your hand, and they shall be as frontlets between your eyes. You shall write them on the doorposts of your house and on your gates. Jeremiah 31:3 The LORD has appeared of old to me, saying: "Yes, I have loved you with an everlasting love; Therefore with lovingkindness I have drawn you. Mothers are renown for their amazing love. Considering that all love comes from God, just think about how much God loves you. "For love is of God; and everyone who loves is born of God and knows God." (1 John 4:7) Each one of us is God's "favorite creation"! God's love for you has nothing to do with your background, your origin and skin color, your financial status, IQ, your neighborhood or other circumstances. Take a look at yourself - you are God's "favorite creation". If you have already got to know God closer, then you know exactly that God means it sincerely with His love. How is it with you? Do you return His love?